With less than a month of Lent remaining and Easter right around the corner we wanted to share fish-friendly recipes to enjoy this season. Whether you’re abstaining from eating meat on Fridays or just want a more fun and flavorful way to incorporate fish into your diet, internationally celebrated Chef Diego Muñoz of 1111 Peruvian Bistro in Miami has created 2 recipes to carry you through the 40 days of Lent and beyond. With a sharp knife, slice the fish as thin as possible to get bite-size slices. Spread the thin slices onto a flat plate lined with parchment paper. There should be about 9 slices per portion. With the palm of the hand, break the garlic clove in half and remove leaves from the cilantro sprigs to release all the flavor. Place both in a bowl and add lime juice, TABASCO® Sauce, olive oil, salt and pepper. Pass the mixture through a strainer over a small bowl, and place in refrigerator. Dressing should taste tangy and spicy. Preheat oven to 200°F. Toss cherry tomatoes in 4 teaspoons of olive oil with a pinch of sea salt on a baking sheet and bake for 30 minutes. Let cool before plating. On a flat, cold plate, spread 1 teaspoon of olive oil evenly over plate. and rub to spread evenly. Add ¼ teaspoons of TABASCO® Sauce and a pinch of salt. Arrange the fish in one layer like a carpaccio and top the fish with tiradito dressing. Add 3 cherry tomato halves and top with parmesan cheese. Add capers on top of the fish and finish with a bit of olive oil and cilantro leaves. Repeat for remaining dishes. Serve immediately. In a bowl, mix the lime juice and two teaspoons of lime zest with soy sauce, TABASCO® Sauce, ginger, garlic, and salt. Cut the calamari bodies into 1-inch thick rings. 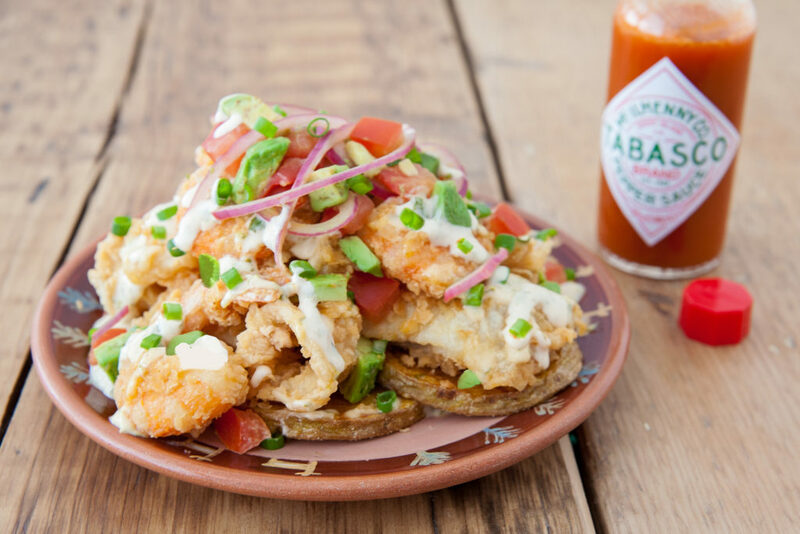 Marinate the fish, calamari and shrimp together in the soy sauce, TABASCO® Sauce, ginger, and garlic mixture, place in refrigerator for 15 minutes. Place potatoes in a large pot with skins on. Add enough water to cover potatoes and bring to a boil. Boil for 35 minutes. Once tender, slice them in 1/2-inch thick slices and let cool. Fill a pot with oil and heat to 360°F. Place eggs in a medium sized bowl and in a separate medium sized bowl, place flour. Remove seafood from marinade, dip the seafood into bowl with egg mixture and then transfer to bowl with flour and coat evenly Place in hot oil. Fry the fish for 1.5 minutes, followed by the shrimp for 1.5 minutes and then the calamari for 2 minutes. Once the seafood is crispy, remove from the oil and place on a paper towel. Season with salt and pepper. Drizzle canola oil onto a skillet over medium-high heat. Fry the potato slices until edges are crisp and place them on a paper towel. Season with salt. In a bowl, mix mayonnaise, lime juice, and lime zest. Add the TABASCO® Sauce, chopped cilantro, and pepper to taste, and mix well. Set aside. Rinse the sliced onion in cold water. In a bowl, mix the sliced vegetables with lime juice, TABASCO® Sauce, and parsley. Season with salt and pepper to taste. On a flat plate, add 2 fried potato slices and arrange the fish, calamari rings, and whole shrimp together with the calamari tentacles on top. Top with spicy mayo mix and salsa. Sprinkle scallions and serve immediately. 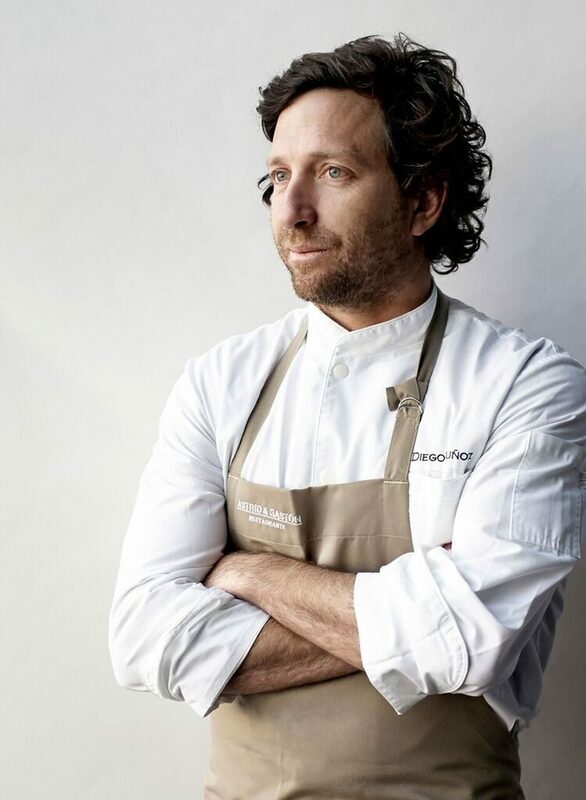 Peruvian Diego Muñoz belongs to the new generation of chefs promoting the spread of Peruvian Cuisine and Latin American heritage around the world. Diego Muñoz trained at Le Cordon Bleu in Canada and Paris, he has worked at the mythical restaurants Mugaritz and El Bulli in Spain, led the kitchen of Bilson’s in Australia, and led Lima Peru’s Astrid & Gastón, taking the restaurant to #1 on The Latin American 50 Best Restaurants List, and to #14 on The World’s 50 Best Restaurant’s List.